Posted in Cooking & Nutrition on December 7, 2013. Last modified on April 02, 2019. Read disclaimer. 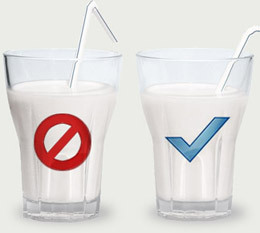 According to the US Centers for Disease Control, less than 1% of the milk Americans drink is raw or non-pasteurized. They report, however, that this minute amount accounted for 82% of all dairy-related disease outbreaks between 1973 and 2009 -- everything from diarrhea, cramping and vomiting to kidney damage, chronic disorders or even death. Apparently, most at-risk are pregnant women, children, elderly and people who may be immune compromised. So it is little wonder that the US banned interstate commerce of raw milk (including cow, goat or sheep) in 1987 and approximately half of the states have outlawed the sale of raw milk for human consumption -- citing its tremendous potential for bacterial contamination. And most authorities believe that pasteurization in no way compromises raw milk's benefits. There is no shortage of ways that milk can become contaminated: unsanitary housing and milking practices, mishandling of the milk by the producer, diseased cows, environmental bacteria or consumers not keeping it refrigerator at 40 F or below and not drinking or using it in a timely manner. And, according to the CDC, pasteurization is the only way of killing these bacteria, parasites and viruses. Other governments such as Canada and Australia agree. How was the human race able to survive, since evidence indicates that we've been drinking raw milk for at least the last 10,000 years? In fact, pasteurization was introduced only 150 years ago (1862) and wasn't widely adopted until the 1920s to 1950s? Why are pro raw milk rallies being held around the country with demand growing exponentially and consumers paying up to 3 times as much as for pasteurized milk? Why is raw milk still legal and widely available through much of Europe (even through automatic vending machines in Italy, France, New Zealand, Slovenia and Poland)? Pasteurization adversely effects the nutrition, enzymes, hormones and beneficial bacteria components of milk. Pasteurized milk can contribute to allergies, asthma, digestive problems, auto immune diseases, autism, compromised immunity and other human diseases. Pasteurization was merited in the 1920's when cow-borne tuberculosis was being spread to humans by milk, but that situation has now been resolved. Technological advances now enable us to test for the presence of Salmonella, the primary bacterial concern. Milk should not be singled out when the sale of raw meat and vegetables is perfectly acceptable -- yet those are responsible for a far greater number of food-borne illnesses. Perhaps what is really happening here is that many Americans are drawing a line in the sand; taking a stand against what they consider to be over-reaching government regulations and demanding the freedom to make their own health choices for themselves and their families. To learn more about the raw milk debate, watch Harvard Food Law Society's Raw Milk Debate. Writers comment (as someone who raises goats and drinks fresh, raw milk): The majority of dairy goat hobby farmers and small-scale producers in our area pasteurize every drop of milk consumed by their goat kids. The owners are present to deliver the babies; they immediately separate the kids from the mother; and begin bottle-feeding them with heat-treated goat colostrum (held at 130 F for 1 hour) and pasteurized milk (drawn from the nannies and heated to 165 for 10 seconds). Most of the breeders we know have followed this practice for the past 25 years and it has dramatically reduce incidents of Caprine Arthritis Encephalitis, a debilitating disease passed between goats by raw milk. The many generations of goats raised strictly on pasteurized milk appear to be doing fine. I noticed at the bottom of the post that you, personally, raise dairy goats. According to my neighbor, her first daughter was lactose intolerant but was able to drink goat milk just fine. Do you know anything about this? Unfortunately, goats milk seems to be hard to find. 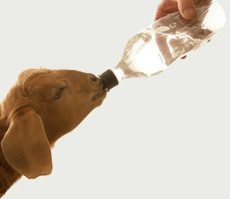 On the topic of goat's milk, here is an interesting article from the National Park Service website on the health benefits of goat's milk. But to address the lactose intolerance question specifically, Prevention magazine estimates that well over half of us have some level of lactose intolerance. Lactose is actually just a sugar that's broken down by an enzyme (lactase) that some of us produce less of. Fortunately, for most of us the side-effects of consuming dairy are merely a minor inconvenience. Others may do better with eating aged cheeses (where enzymes in the cheese break down the lactose), yogurt or kefir (where beneficial bacteria eat up a lot of the lactose sugar), and -- yes -- goats milk. Apparently, goats milk contains less lactose and, for reasons listed in the Park Service link, it is easier to digest than cow milk. Or, people with minor lactose intolerance may consider taking lactase digestive enzyme supplements (Amazon affiliate link). However, people who are severely lactose intolerant make practically no lactase enzyme at all and should avoid all dairy... including goats milk. Thanks for your wonderful question. I hope this info helps. That is a very helpful guide. Thanks for sharing the link.